This is the final post of a three part series of a Florida field trip that this photographer co-coordinated for the South Jersey Camera Club members for the purpose of photographing birds and their behavior. The field trip was conducted over a five-day period in the beginning of March. The first post entitled, ‘Spring Has Sprung: Busy, Busy Birds’, visited the Venice Rookery with an amazing diversity of birds courting, mating and raising offspring. The second post entitled, ‘Spring Has Sprung: Birds of Prey’, traveled to various locations in southwest Florida to photograph birds of prey nesting and caring for their offspring. This post provides a melange of birds captured when visiting the Ding Darling Wildlife Refuge and the Corkscrew Swamp Sanctuary. The Ding Darling Wildlife Refuge consists of 6,400 acres of mangrove forest, submerged seagrass beds, cordgrass marshes, and hardwood hammocks located on Sanibel Island. This refuge provides an important habitat to over 220 species of birds. Here is just a sampling of birds photographed at Ding Darling starting with the ‘Reddish Egret’. The ‘Reddish Egret’ is considered the least common heron in Florida. The population of this heron was almost eradicated due to plume hunting during the 19th century. The species has never fully recovered with the current population in the United States of only about 2,000 pairs primarily residing in southern Florida, along the Gulf of Mexico, and Texas. The feeding behavior of the ‘Reddish Egret’ is captivating to watch. It leaps sideways and quickly changes directions in shallow waters searching for small schools of fish to feed upon. White Pelicans only spend part of their year in Florida. They migrate to their wintering grounds to coastal areas of Florida, Gulf of Mexico and southern California. In March and April they migrate to inland lakes in flocks to their breeding grounds as far north as Utah, Idaho, Minnesota and Canada. The ‘White Pelican’ is considered one of the largest birds in the United States with a 9-foot (2.7 meter) wingspan. This pelican was rigorously fluffing its wings and having a bath. ‘Blue-winged Teal’ are long distance migrants with their territory throughout the United States, Canada, Mexico and northern South America. The can be found wintering in Florida and will migrate northward in the spring to breeding grounds. This ‘Tricolored Heron’ is standing absolutely still, not necessarily to get photographed, but waiting for prey to approach it. Its’ prey consist of small fish, crustaceans, and aquatic insects. It is a remarkably slender bird with long beak, neck and legs. The ‘Tricolored Heron’ is common along the coastal habitats of the Southeastern United States. The ‘White Ibis’ is a wading bird residing in the deep South. It is one of the most numerous wading birds in Florida although the population has been declining in recent decades due to the loss of feeding and nesting habitats. The ‘Little Blue Heron’ is another bird that resides mostly in the deep southern United States and Mexico. It looks much like a Snowy Egret when it is young, but molts to the dark slate-blue plumage as an adult. This ‘Juvenile Yellow-Crowned Night Heron’ was stalking prey along the bank. These birds are often active at night. It is interesting that this species shows up several times in fossil records with the earliest fossil record being 2 to 2.5 million years old from Sarasota, Florida. The ‘Wood Stork’ is considered one of Florida’s ‘signature’ wading birds. It is classified as ‘threatened’ by the State of Florida and federal government due to the destruction and degradation of the wetlands. This alligator is a resident of the Ding Darling Refuge. Here this gator was basking in the sun to control its body heat. Adult gators enjoy a diet of fish, snakes, turtles, small mammals, and birds. Perhaps we should let this gator know which birds are protected. And perhaps this gator provides some protection benefits for the birds from predatory mammals. The Corkscrew Swamp Sanctuary is a very tranquil sanctuary with an extensive boardwalk to transverse though this wetland. It is not to be missed. This sanctuary is part of the Western Everglades in Southwest Florida. It consists of approximately 13,000 acres and is primarily composed of wetlands and includes the largest remaining virgin bald cypress forest in the world. The National Audubon Society has been ultimately responsible for acquiring, protecting and maintaining this sanctuary. Not only is the sanctuary important for a variety of endangered or federal or state listed birds including the Wood Storks, White Ibis, Roseate Spoonbill, Tricolored Heron, but also for protecting a variety of other species including the Florida panther, American Alligator, and Florida Black Bear. Several rare plants are also found at this sanctuary including the Ghost Orchid. Crocodiles also inhabit this sanctuary. The primary physical difference between crocodiles and alligators is the shape of their snout. Crocodiles have long and pointed, V-shaped snouts and alligators have rounded, U-shaped snouts. ‘Anhinguas’ primary habitats are cypress swamps, rivers and wooded ponds. This pair of ‘Anhingua’ was attending to their nest. There were a number of songbirds to view including some very common ones. The lighting on these birds is a photographer’s dream. Then there was the exquisite ‘Painted Bunting’ in full display. The ‘Painted Bunting’ breeds in the coastal Southeast and south-central United States. Florida is a very seductive place to visit for a number of reasons and that would include another seductive sunset at a beach in Naples. So, here we are being seduced again, as the brown pelicans roost for the evening. Never underestimate what a nature park can offer and teach you. 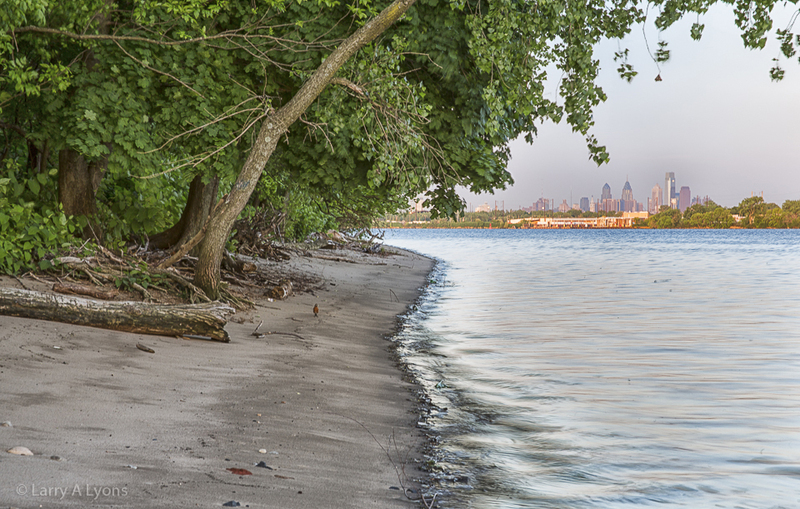 Take for example a nature park situated in New Jersey just across from the City of Philadelphia. The Palmyra Cove Nature Park (www.palmyracove.org) is a 350 acre site located within a highly developed urban and commercial area in southern New Jersey. 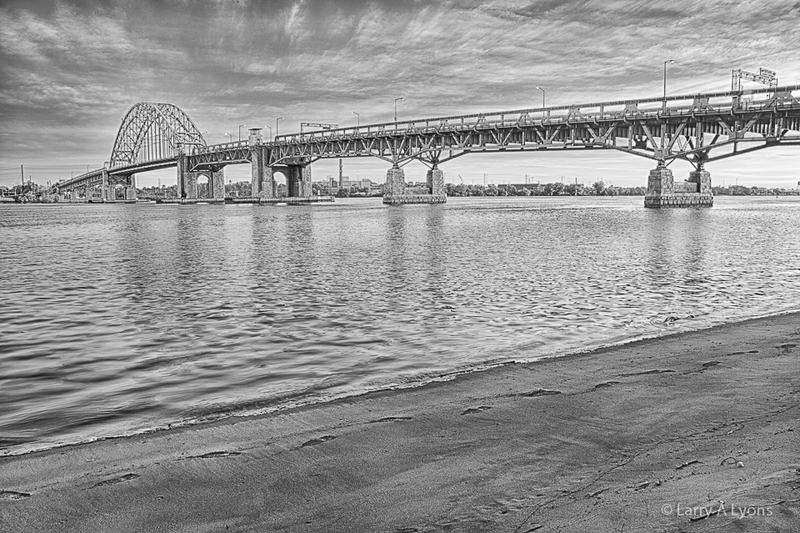 The park is bordered along the Delaware River just south of the Tacony-Palmyra Bridge. Five field trips to the Palmyra Cove Nature Center during the spring of 2013 provided an opportunity to observe and photograph an amazing diversity of organisms and their behavior. Let’s begin with the Great Horned Owl. This owl is one of the largest owls in North America and one of the most ferocious birds of prey. Both sexes tend to look similar, but the female is 10 to 20 percent larger than the male. 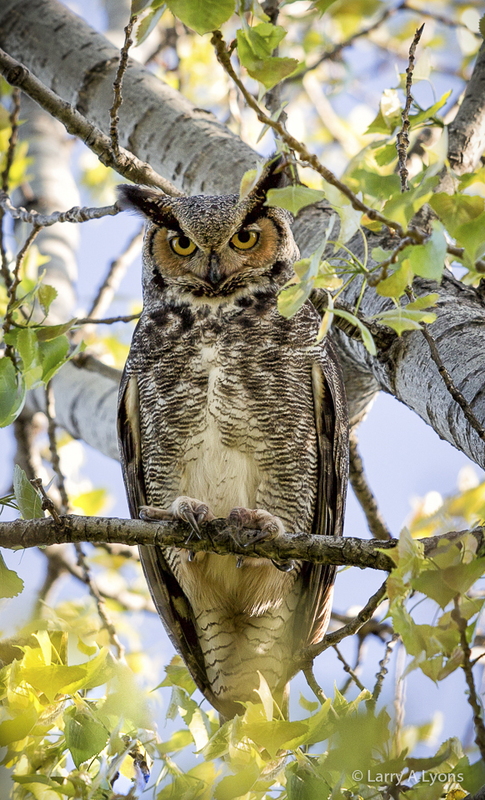 Distinguishing features of the great horned owl are long ear tufts, intimidating stares with their yellow eyes, and densely feathered toes with dark horned claws. General coloration does vary between the owls. 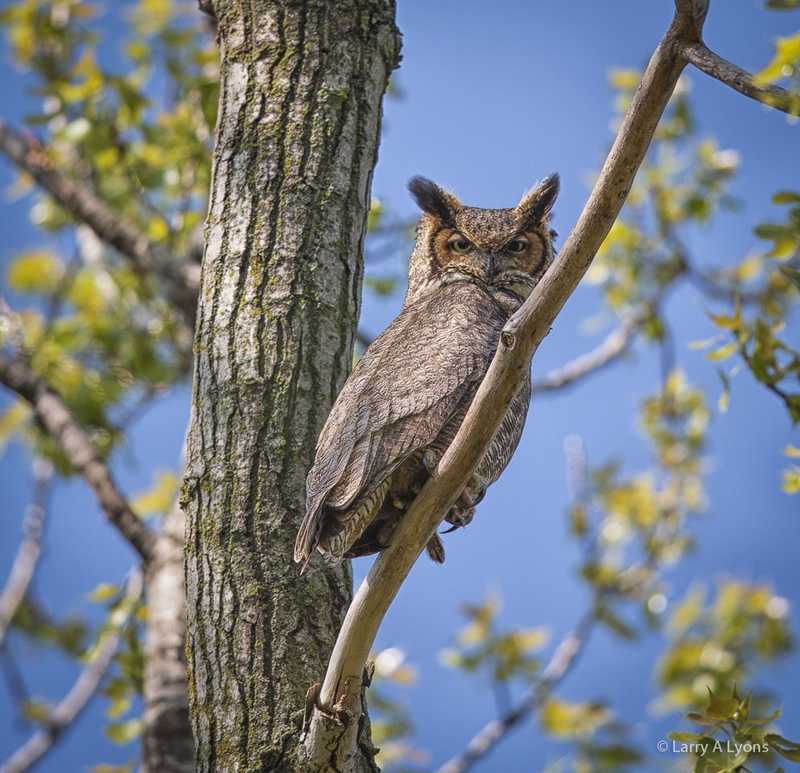 A pair of Great Horned Owls selected a nesting site high up in the crotch of a cottonwood tree. Nesting begins as early as January or February and the female will typically lay two eggs. 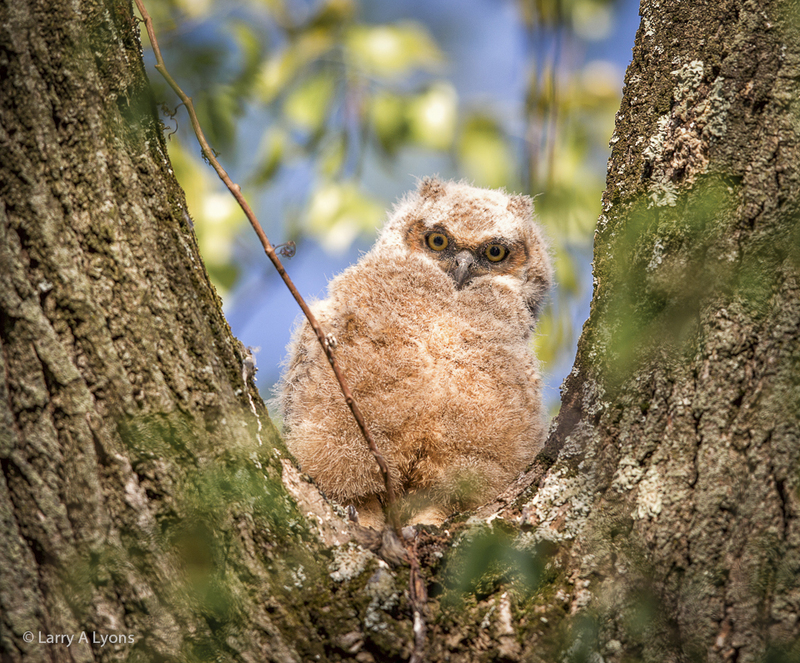 After hatching the nestlings are unable to fly for ten to twelve weeks, but the owlets will venture to nearby trees. 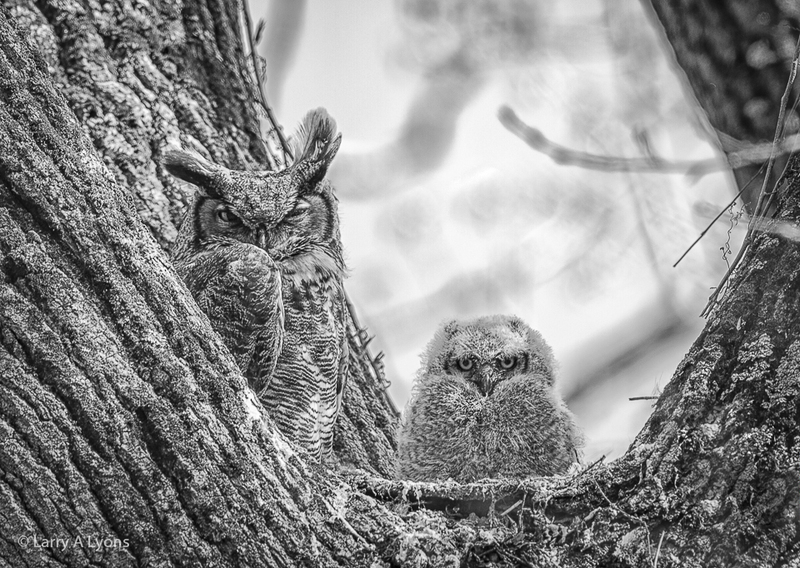 One of the owlets remained in the original nesting site while the other owlet had moved to a lower a branch. 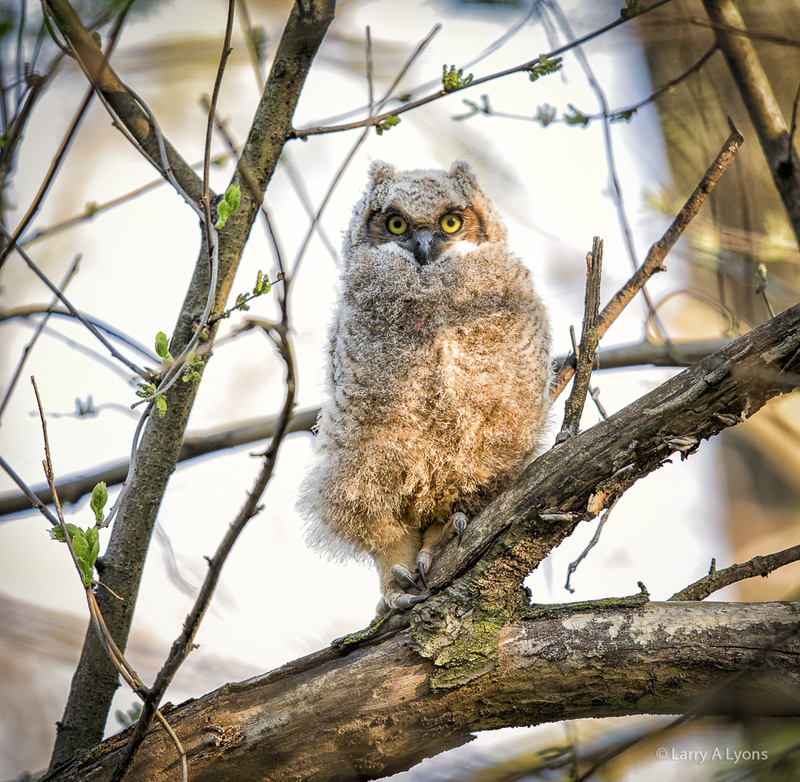 Both owlets are being cared for by both parents and remain dependent for food until the fall. 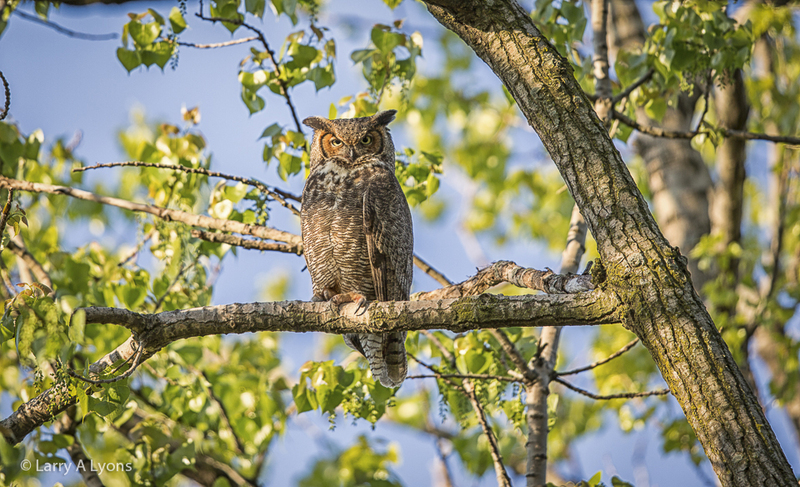 Great horned owls are ferocious predators and will hunt and eat all sorts of small and medium sized mammals (mice, squirrels, opossums, bats, and skunk). It will also eat small and large birds, including Canada geese, herons, ducks, and turkey. Owl prey can also be raccoon. It was amazing but only 20 feet away from the tree where the owlets were being raised were raccoons residing within a tree hollow. 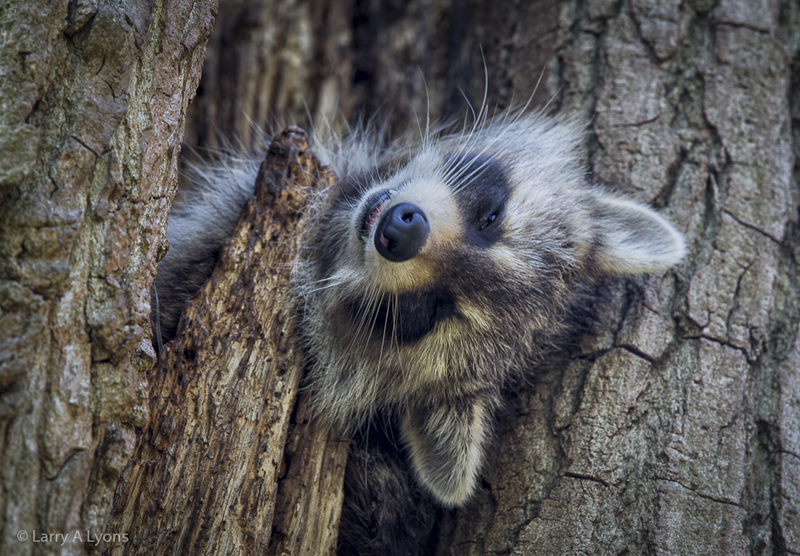 Raccoons, like great horned owls, are nocturnal and tend to sleep during the daytime. 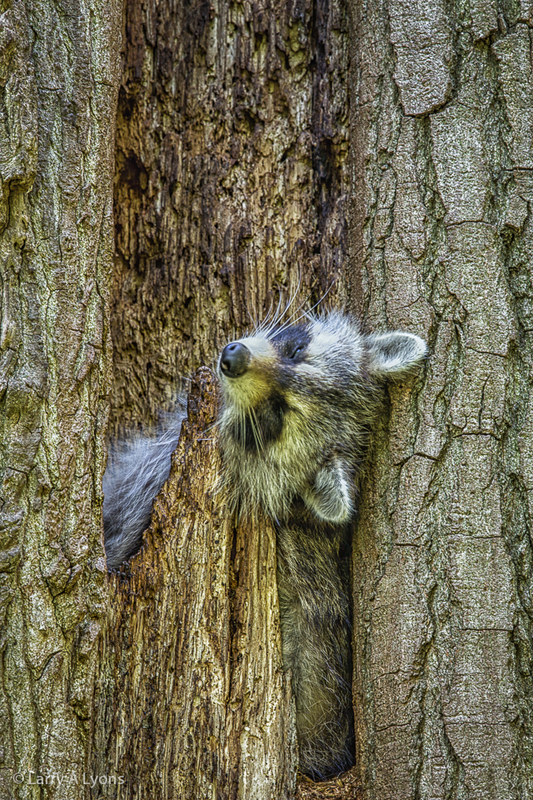 This one was resting in a vertical position in the hollow of the tree. Trekking around the ponds at Palmyra Cove Nature Park can provide some great opportunities to observe birdlife and some interesting and bizarre behaviors. One such encounter involved a courting encounter amongst blue-winged teals. 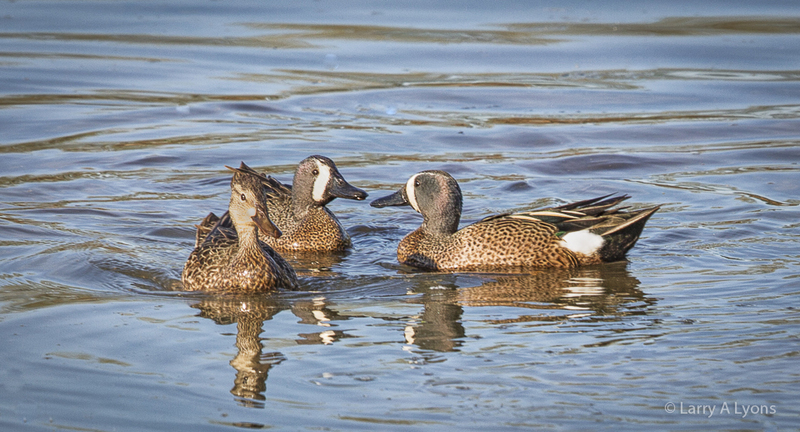 Blue-winged teals are known to be the last duck to migrate north in the spring throughout most of the United States. Once they arrive in their northern breeding areas, pairs of teals will settle in vegetated wetlands and ponds to begin the next generation. Blue-winged teals are monogamous during the mating season and are known to have some exaggerated behavior when courting. 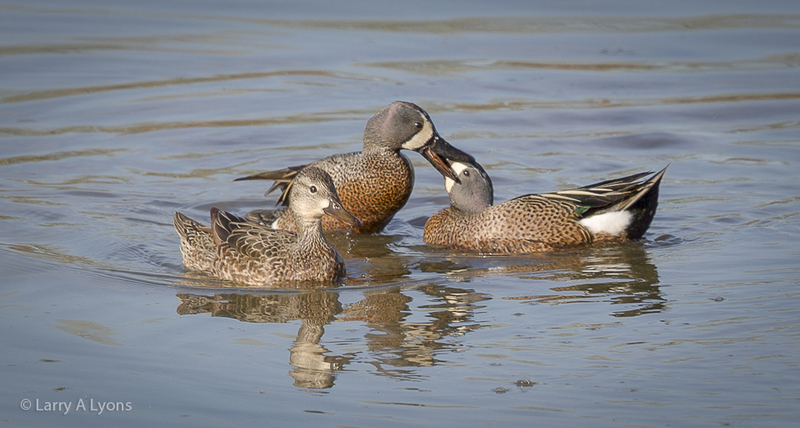 One such encounter was when another male attempted to intrude upon this pair of teals. The paired male quickly made it quite clear by grasping the beak of the intruder. The intruder was able to pull its beak away from the grasp and then was aggressively chased away. Blue-winged teal are so named because both sexes have some blue feathers on their forewings, but really cannot be seen until they are taking off or in flight. The male, on the other hand, is distinguished with slate gray head and neck and white crescent in front of the eyes. Palmyra Cove Nature Center has a frog pond that is inhabited or utilized by several different amphibians. 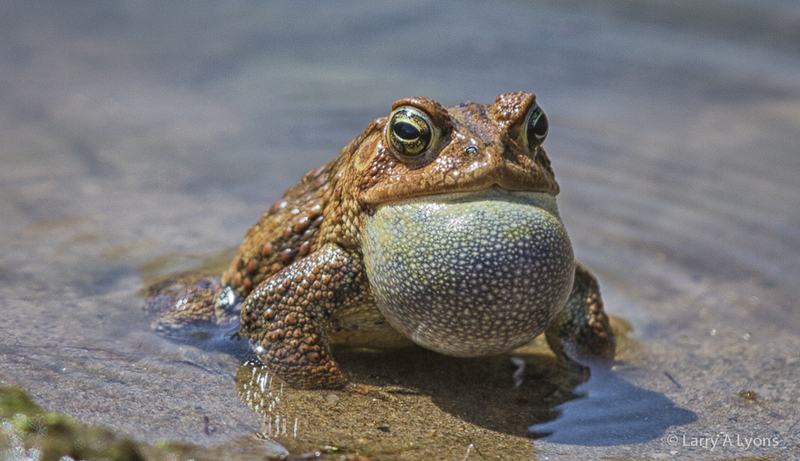 One unusual amphibian that only visits the pond once a year to breed is the Fowler’s Toad. The Fowler’s Toad is generally terrestrial and nocturnal except when this amphibian is in breeding mode. So, come spring to early summer, Fowlers’ Toads will venture out from the nearby woods to a wetland or shallow pond to breed. The male toad, measuring about two to three inches in size (5.1 to 7.5 cm. ), will produce a call to attract the females. 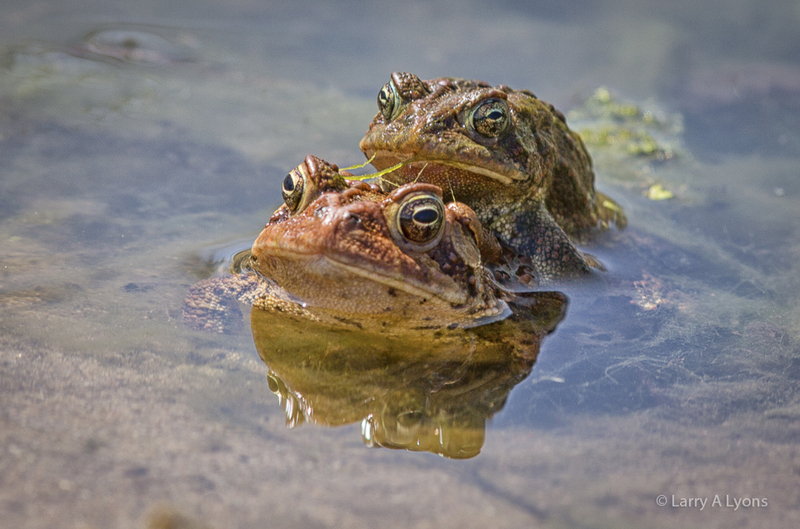 The toads will proceed into what is referred to as amplexus, also known as the “Latin Embrace”. This embrace is a form of pseudocopulation where the male grasps the female with his front legs. The male then releases a fluid with sperm into the water and externally fertilizes the female eggs. The female lays eggs in clutches up to 25,000 eggs. There were hundreds of toads in the pond participating in this breeding ritual on this particular day. However, on a return trip of the following week, there was not a single toad to be seen, but there must had been thousands of tadpoles (about one half inch in size) swimming in the pond. Metamorphosis from tadpole to young toad occurs within two months. The frog pond is also shared with other amphibians, such as, the green frog. 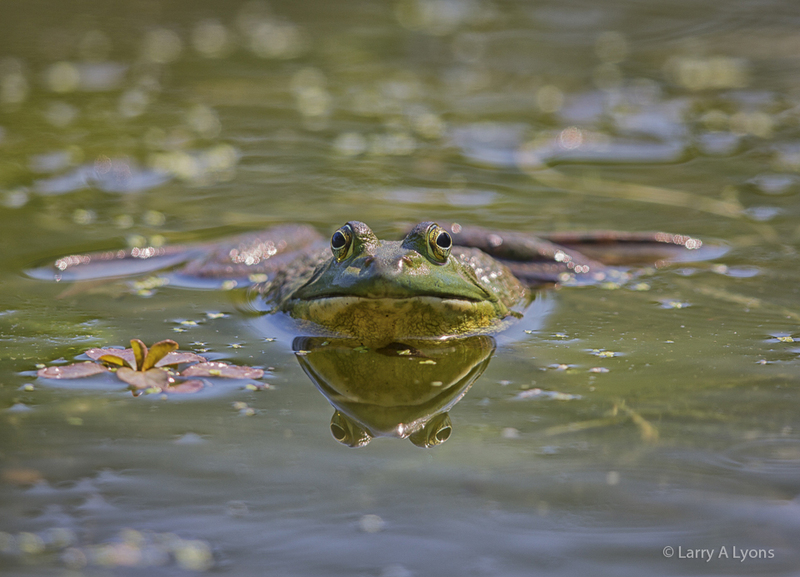 This green frog surely would have found the eggs and the tadpoles of the Fowler’s Toad a tasty meal. It is all part of nature. 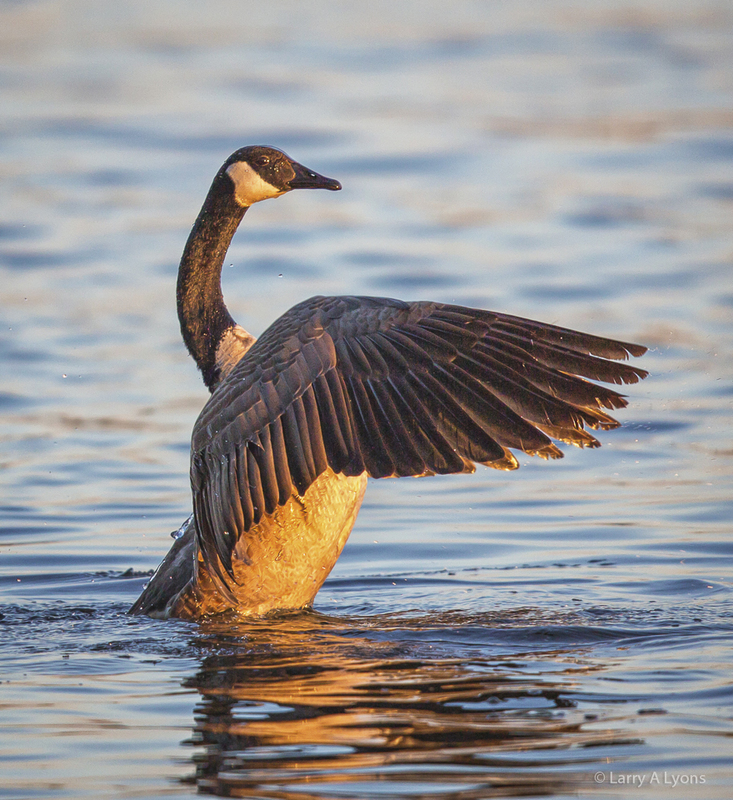 Canada geese are so common that their increasing populations have become a nuisance at some locations. However, even though their presence is often taken for granted, their behaviors and their life history are quite interesting. Canada geese do pair for life and will remain together over the entire year. In the spring, pairs of Canada geese will separate from their flocks and establish territories to start the next generation. When a goose intrudes into a pairs’ territory, a lot of commotion will evolve in which the male will aggressively challenge the intruder by honking loudly, hissing with their beaks open wide and will even grab and collide between each other. The female is responsible for building the nest and incubating the eggs while the male will be nearby guarding the nest. After the goslings hatch they will remain close to their parents. Canada geese are herbivores and will feed on grasses, sedges, berries, etc. 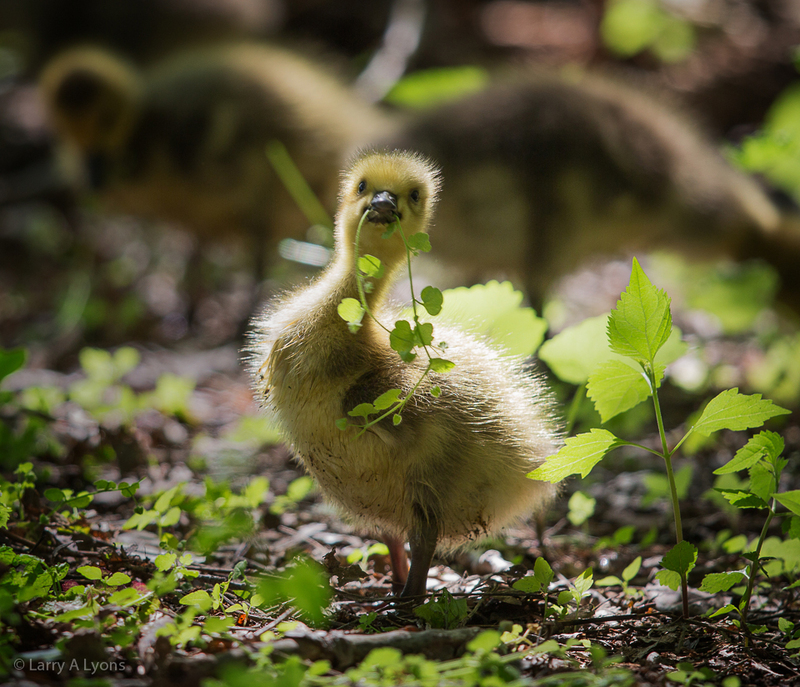 This gosling has learned quickly what is good to eat. 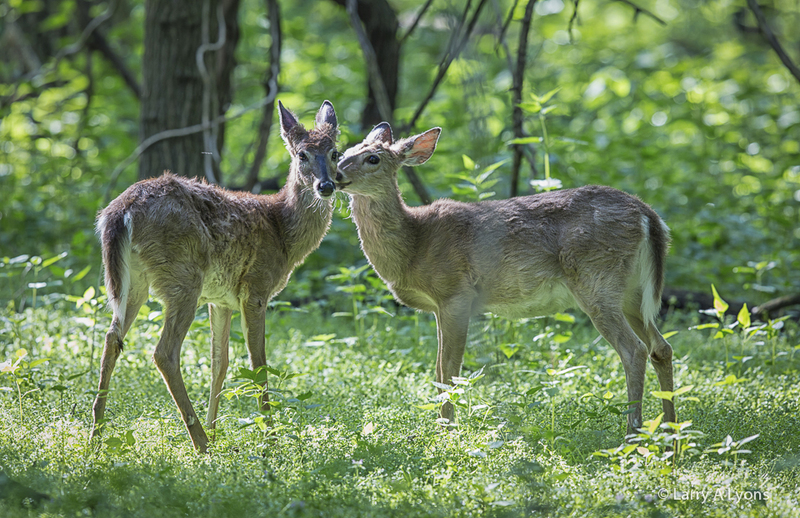 White-tailed deer is another common resident not only at the Palmyra Cove Nature Center, but also throughout the woodlands and suburbs particularly within northeastern United States. 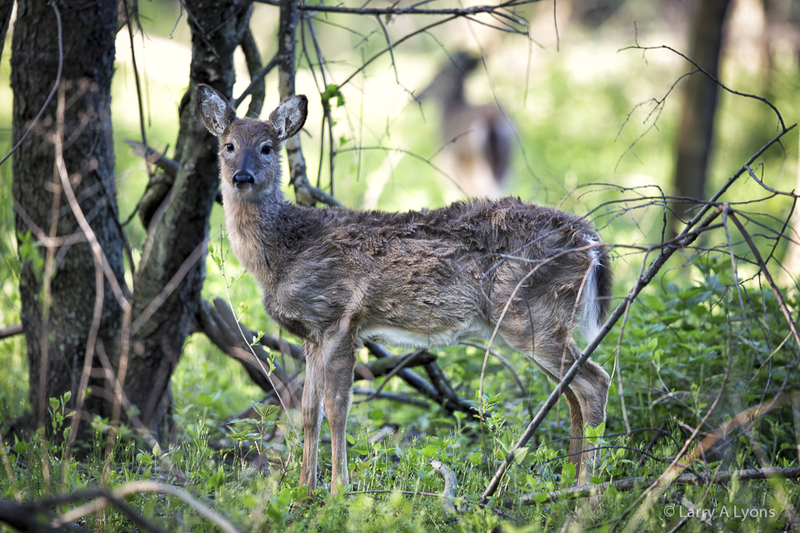 The deer are usually best seen in the early morning or at dusk when they are browsing along the edges of woodlands. Their winter or early spring coats are brownish grey but they will turn to reddish-brown in the summer. 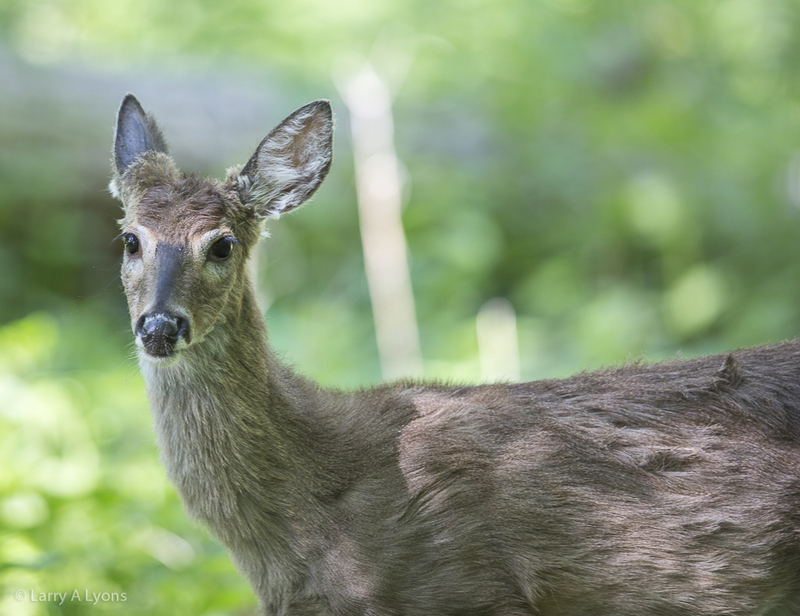 The female deer (doe) stands at about 3 feet at shoulder height and will weigh up to 100 pounds. White-tailed deer are herbivores and will forage on a wide diversity of plants, including agricultural crops, at a rate of 2 to 7 lbs. per 100 lbs of body weight each day. White-tailed deer populations do present significant concerns that have caused negative effects to the deforestation of woodlands. Deer-related collisions with vehicles have also been an increasing problem with the overpopulation of deer. 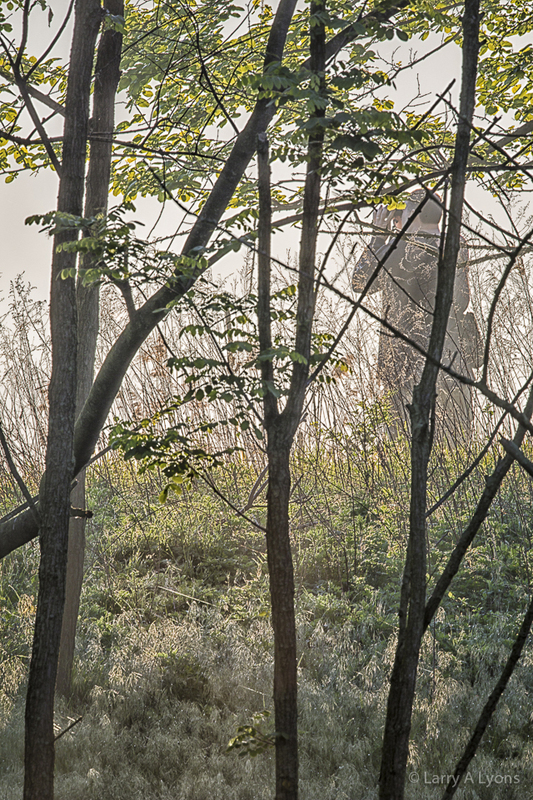 Attempting to maintain or manage deer populations at densities that will not be detrimental has become more and more challenging. 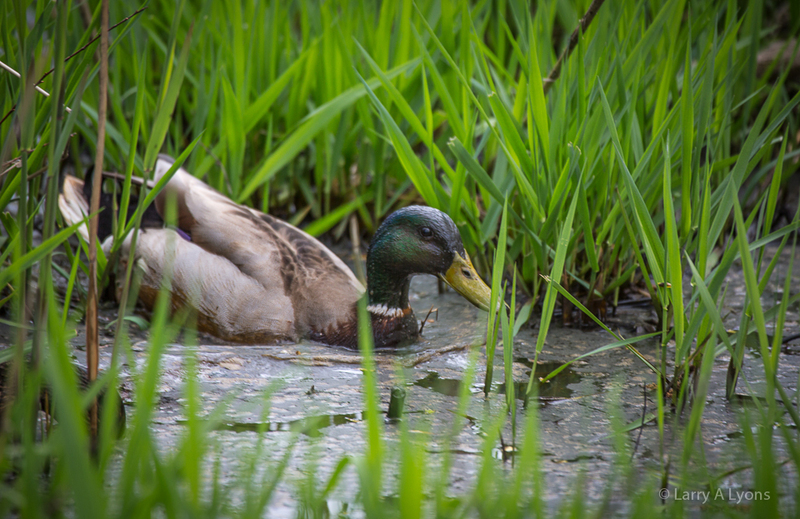 No nature park is without mallards, the most common duck in the United States. The female mallard lays an average of nine eggs and is responsible for incubating the eggs and taking care of the ducklings. To reiterate the take home message of this post: Don’t underestimate what a nature park can offer and teach you. Here was a nature park situated in a highly dense urban area that provided an incredible assortment of habitats. 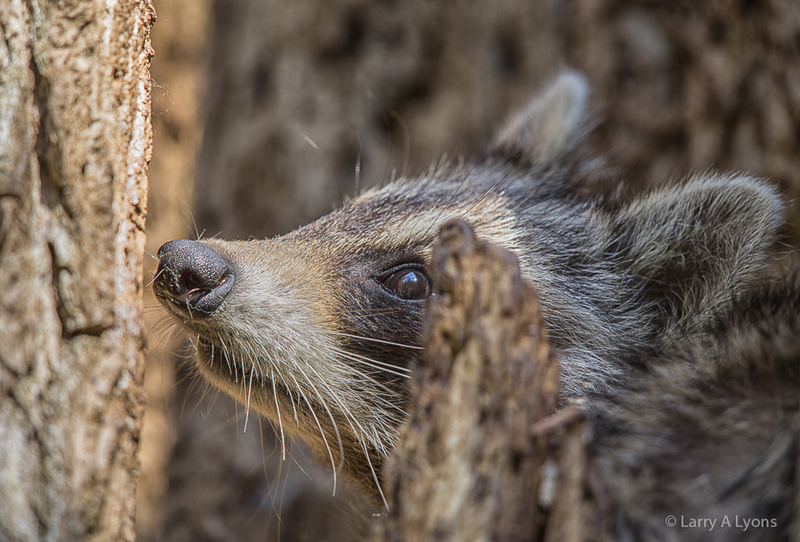 The combination of these habitats allowed for the propagation and sustainability of a diversity of wildlife from amphibians to owls, ducks, songbirds and geese to deer and raccoons. Let’s get our children outdoors and away from their electronic devices. Let them find hidden habitats and enjoy the many wonders of nature. It is “our” next generation that will be responsible for continuing efforts to protect wildlife and maintain a commitment for preserving habitats. Observe, enjoy, learn and, if you are so inclined, photograph them. 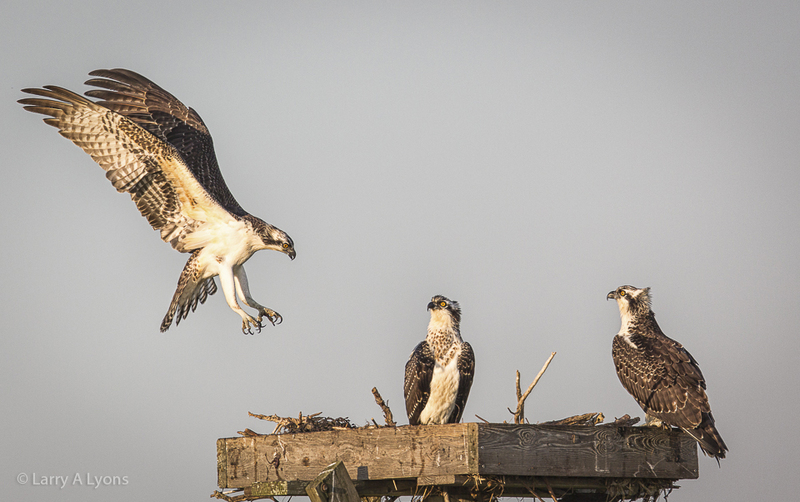 Osprey populations were decimated from the 1950’s to the 1970’s resulting primarily from the widespread use of a persistent insecticide, known as DDT. There were regions in the United States where 90 percent or more of the breeding pairs disappeared. 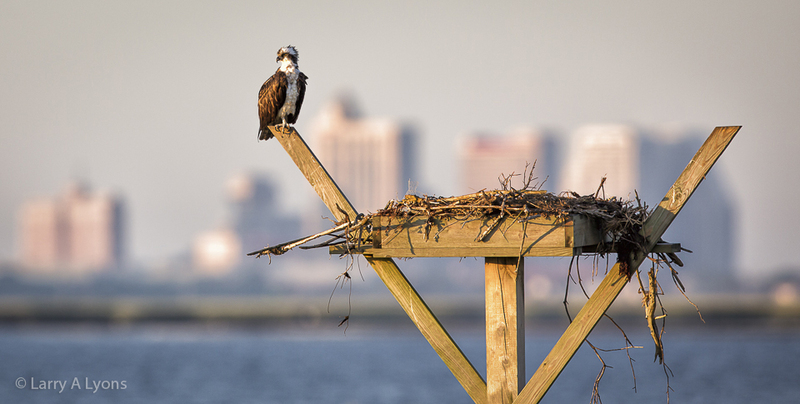 Over 500 osprey nests were present in New Jersey prior to the effects of DDT. By 1974 only 50 nests remained in New Jersey. 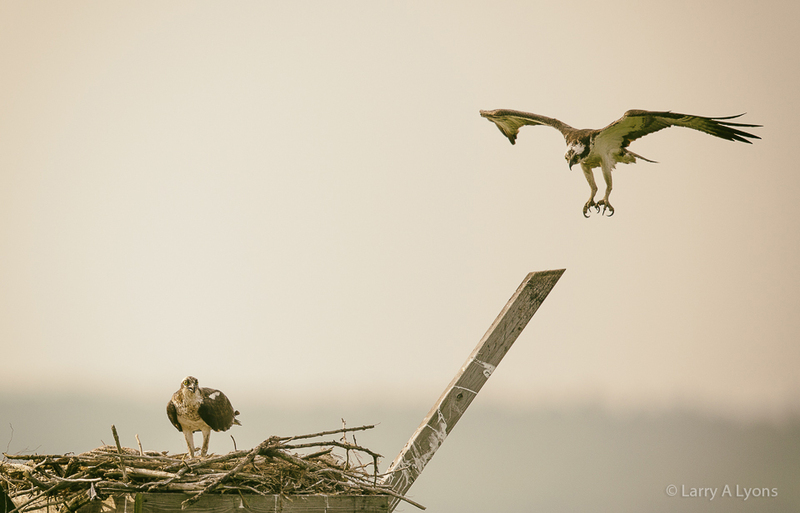 The osprey has become the symbol of how nature can recover from environmental atrocities. DDT was banned in New Jersey in 1968 and banned almost entirely in the United States by 1972. 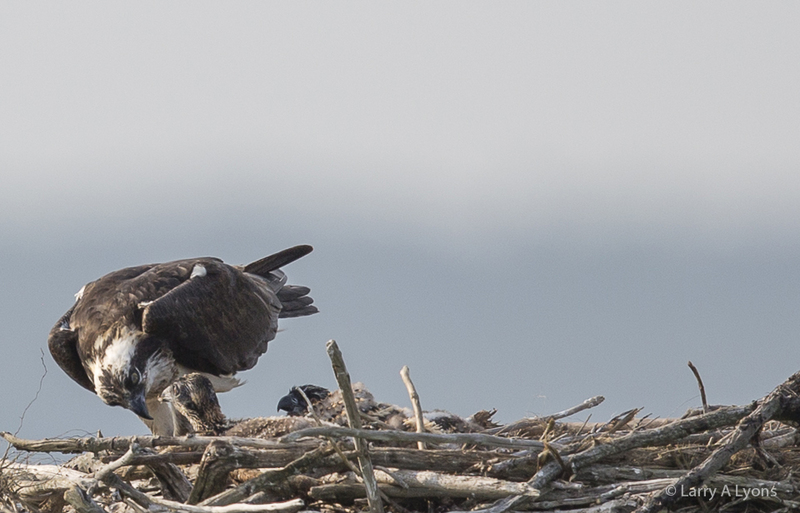 Recovery of the osprey populations began once these bans were implemented. 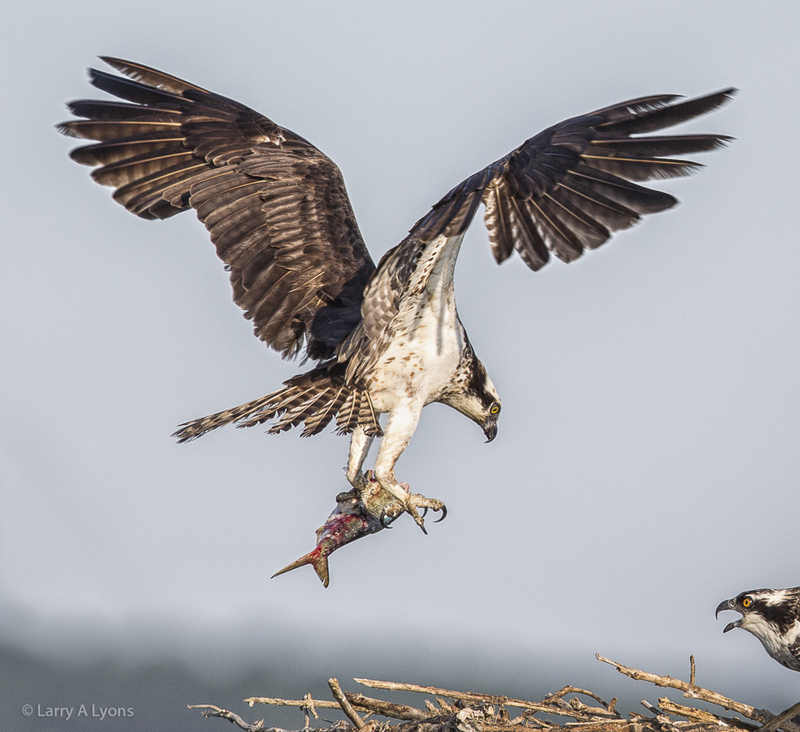 The mechanism of toxicity resulting from DDT to predatory birds, like the osprey, is quite complex that ultimately affects their reproductive success. DDT is a persistent organic pollutant that tends to concentrate as it moves through the food chain. 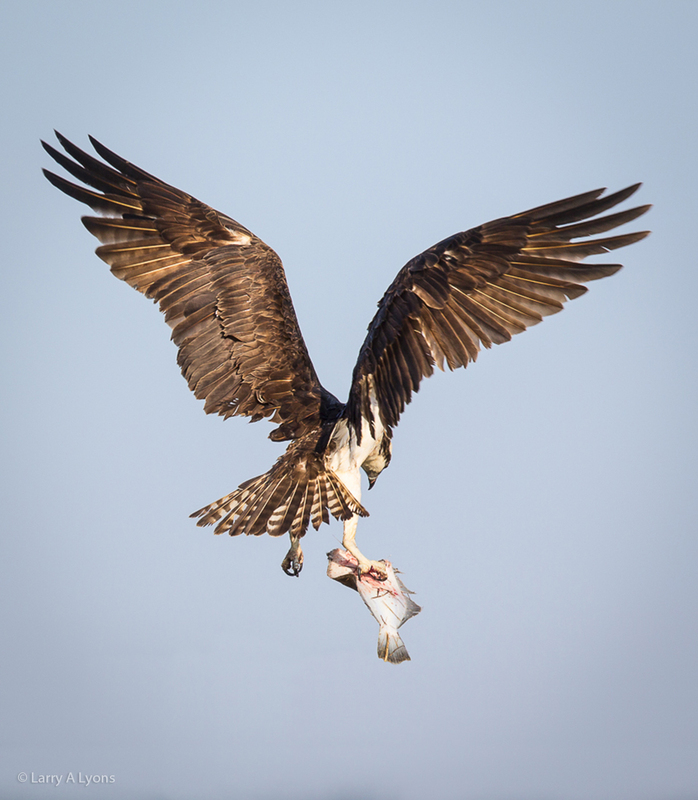 Fish that could be contaminated with DDT from eating shrimp or crabs would further magnify the concentration of DDT in predatory birds, like the osprey. The accumulation of DDT and its metabolites in the osprey prevents calcium metabolism causing the thinning of the eggshells. 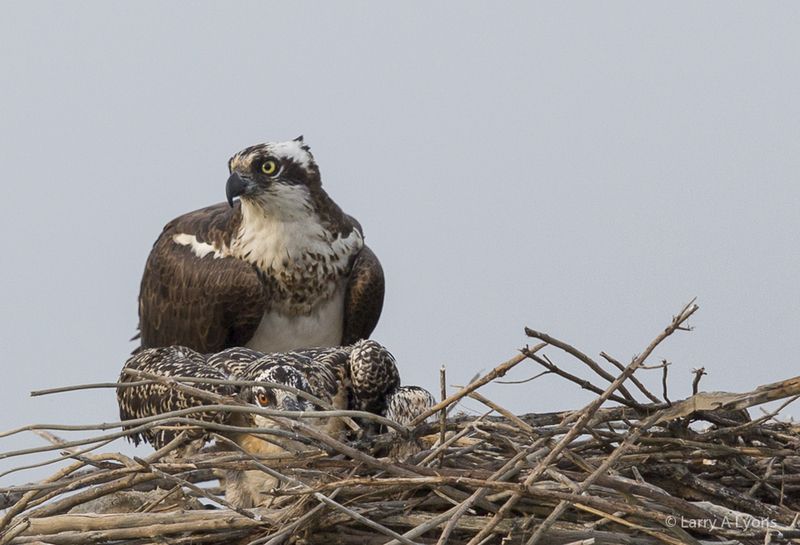 As a result of the eggshell thinning, the osprey would crush the eggs when sitting on them during incubation. The 1962 landmark book “Silent Spring” authored by Rachel Carson clearly expressed how important it is to maintain a vigilance on the use of chemicals and their fate in the environment. This book is often attributed to the environmental movement that was initiated in the 1960’s. 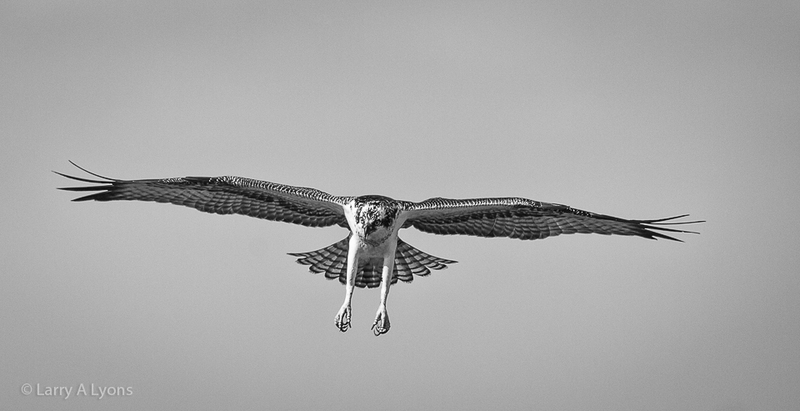 All of the osprey images were photographed at the Edwin B. Forsythe National Wildlife Refuge located on the southern coastline of New Jersey. This refuge, situated just north of Atlantic City, NJ, encompasses 47,000 acres of coastal habitat and is an important sanctuary for a wide diversity of birds and other wildlife. A future post will present many other birds that utilize this refuge. 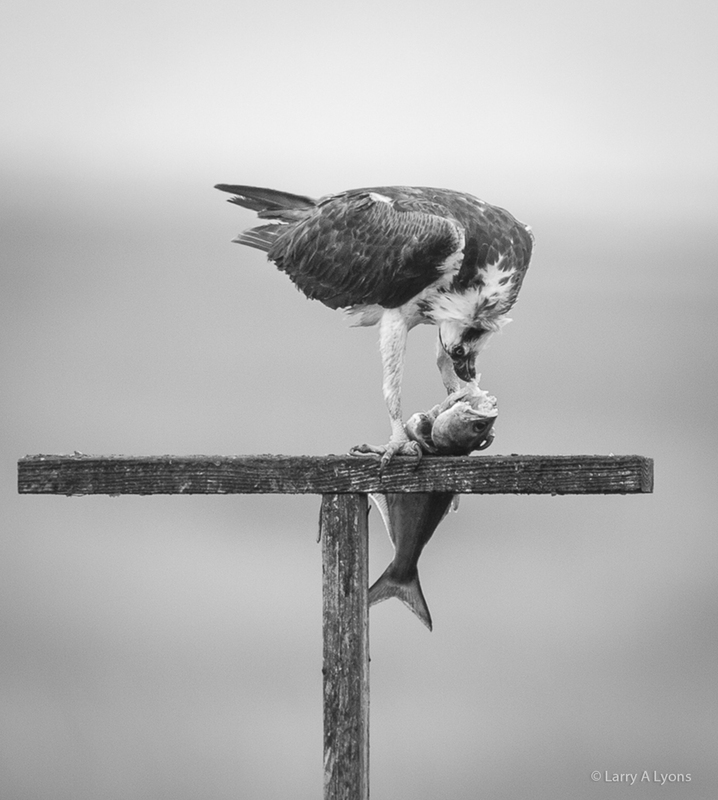 The osprey, also referred to as the fish hawk, has a diet that is almost entirely made-up of fish. Ospreys have gripping pad on their feet that aids in plucking the slippery fish from the water with their long curved talons. 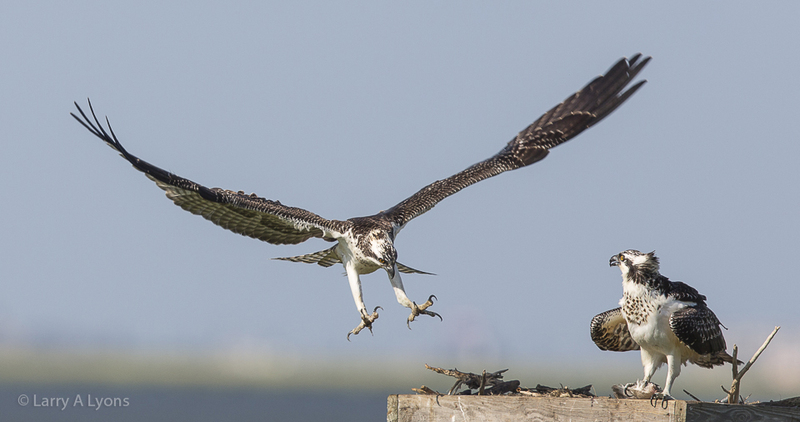 The osprey will orient the fish head first to reduce wind direction when carrying the fish in flight. Here a flounder is being carried back to the nest. 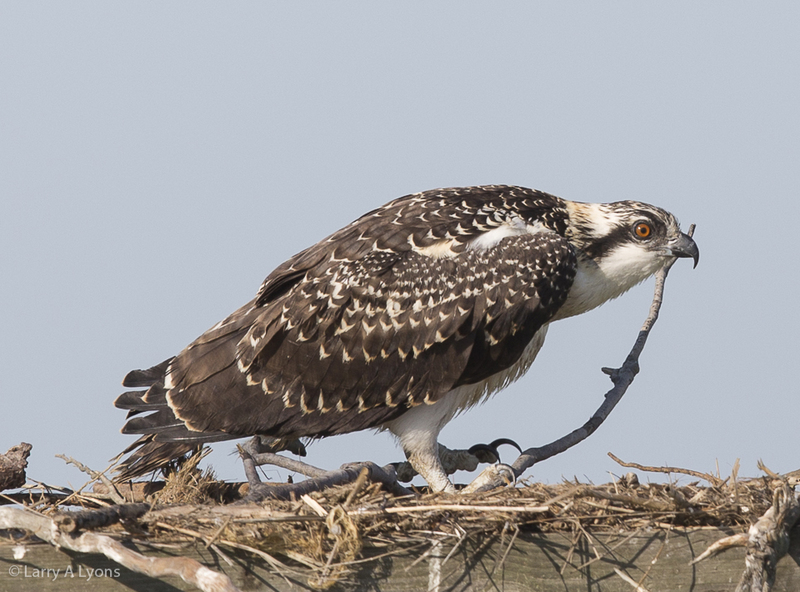 The osprey stands between 21 to 23 inches (53 to 58 cm.) and has a wingspan of up to six feet (1.8 meters). They do require suitable tall structures for building their nests. Platforms are often constructed to allow a suitable structure for nest building. 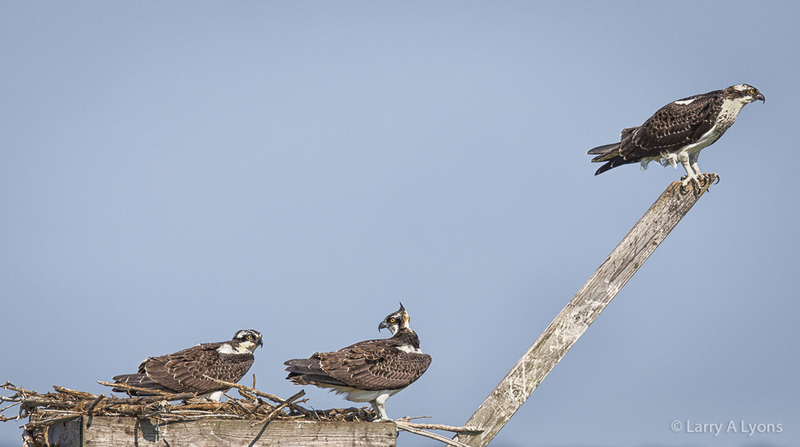 Osprey nests are built of sticks and lined with grasses or seaweed. The male usually fetches most of the nesting material and the female arranges it. 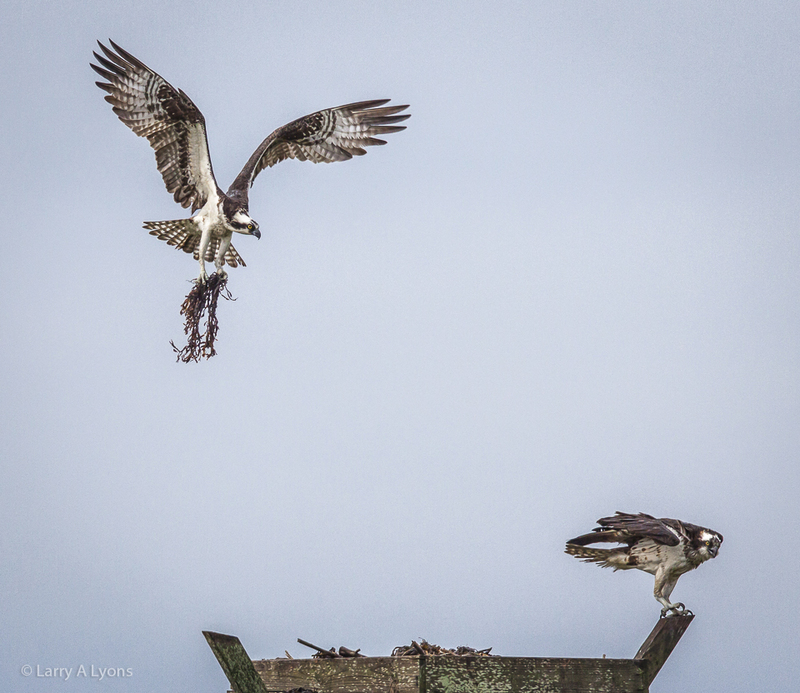 At the Forsythe refuge there are at least eight to ten platforms for the ospreys to build their nests. Males and females do appear similar in appearance, but there are some slight differences that can distinguish between the sexes. Males have a slimmer body and narrower wings. Also, the coloration of the breast band is either lighter or not present in the males. Ospreys mate for life and return to the same nest year after year. They migrate back north in the Spring usually around the beginning of March. The female typically lays three eggs and both parents help to incubate the eggs. Osprey eggs do not hatch all at once, but rather hatching is staggered in time so some siblings are older and more dominant. The pair works together to raise the young. The young fledge at about eight weeks of age and then remain in the area of the nest for about two months. Juvenile ospreys have buff fringes to the plumage of the upper parts, a buff tone to the underbody, and streaked feathers on its head. Juveniles also have orange pupils that turn yellow when they reach adulthood. 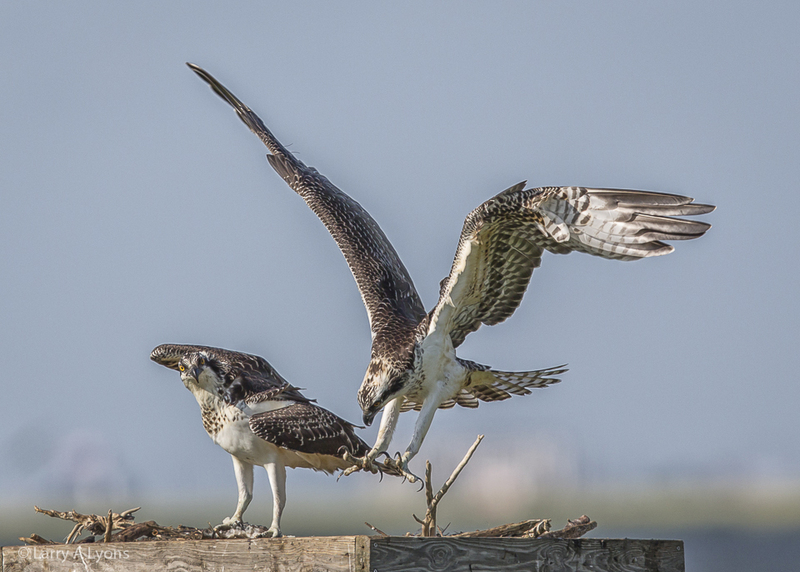 The adults and the juvenile ospreys will begin their southern migration by the end of August or beginning of September to their wintering grounds in Florida, the Caribbean, Central America and South America. 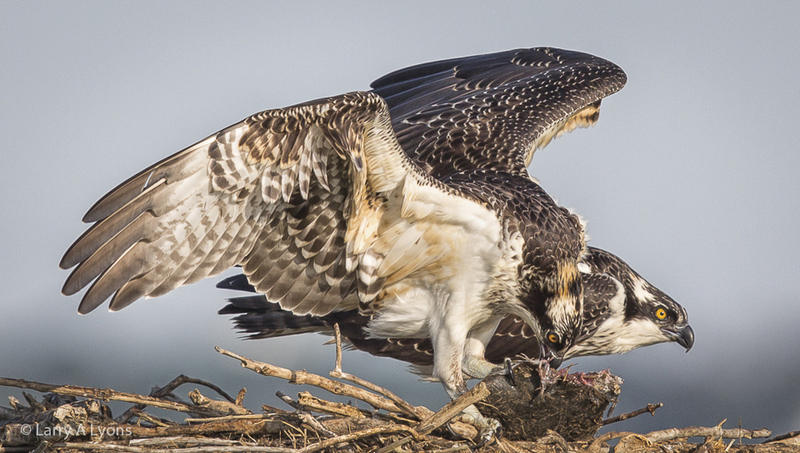 Ospreys are a conservation success story. 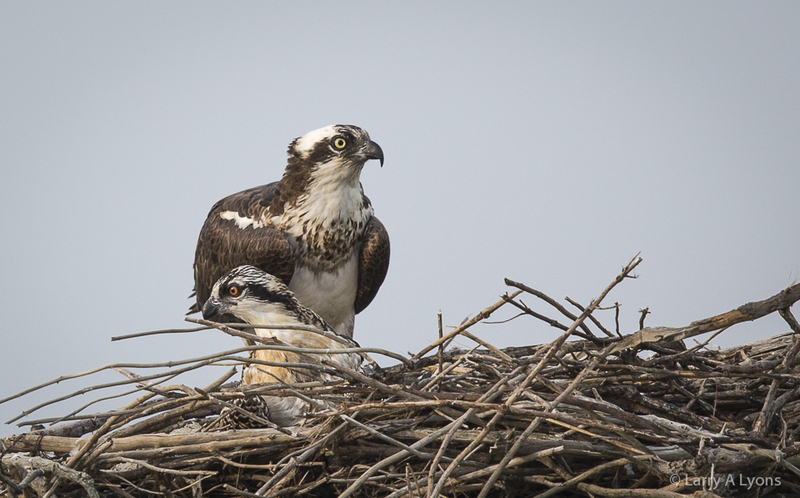 Both the pesticide bans and the construction of artificial nest sites continue to allow for the comeback and growth of osprey populations.